Something new is in store for customers who like to shop on La Mesa Boulevard. 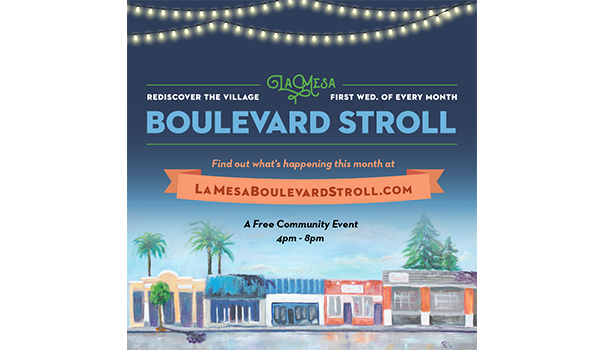 Beginning Aug. 3, La Mesa Boulevard Stroll will take place on the first Wednesday of every month from 4 to 8 p.m. It will be the perfect opportunity for family and friends to explore the newly remodeled Village of La Mesa. Participating businesses will stay open late, offering fun and food, as well as feature guest artists and musicians. Attendees of the La Mesa Boulevard Stroll can pick up their Business Passport to participating businesses at the new Lookout at Legacy Park as well as at the participating businesses themselves. Passports can also be downloaded early at the event website, lamesaboulevardstroll.com. After having their passport stamped at eight or more participating businesses, attendees of the Boulevard Stroll are eligible to enter a monthly drawing for prizes donated by the different participating businesses. The prizes include gift certificates for the new restaurants and boutiques on La Mesa Boulevard, free dance classes, haircuts, massages, facials and much more.A collaboration of business owners calling themselves the La Mesa Boulevard Stroll Community Group has worked to get the Stroll off to a good start. They are confident the event will be a success and envision future strolls to include photography contests, historic walking tours, and picnics in the park. Theresa Favro, owner of Amethyst Moon, has been a prime mover in getting the Stroll off the ground. “As a merchant on La Mesa Boulevard I love to see community events. These always bring new clients. I want to see La Mesa Village grow,” Favro said. Roz Oserin, co-owner of Pret-a-Porter Salon and Spa, said that the city of La Mesa has been extremely supportive of the Community Group’s venture. “Lyn Dedmon has walked us through the process of getting permits, insurance and the other necessary prerequisites for an event like this, and everyone at the city has been very positive and helpful,” Oserin said. “We are all excited about the changes and new businesses moving in. One of my favorite things about La Mesa Village is the sense of community. Everyone here works well together and promotes each other’s businesses. It’s a win-win for everyone.” said Favro. “It has been wonderful to get to know some of the other small business owners and realize the desire that we all have to see our downtown area as a hub of activity again. Creating a sense of community is the first step towards having thriving businesses,” Oserin said. Located at the western end of the boulevard by Acacia, Pret-a-Porter Salon and Spa will have an art table for the children where they can complete little art projects which they can take home. For the adults, there will be complimentary chair massages, makeup touch-ups and opportunity drawings to win gift certificates for spa services. For more information and updates, join the Boulevard Stroll conversation on Facebook, Twitter and Instagram, or to speak with the La Mesa Boulevard Community Group, contact lamesaboulevardstroll@gmail.com. —Cynthia Robertson is a San Diego-based freelance writer. Reach her at c1g2robertson@gmail.com. Thanks, Kim, for your help in bringing the Boulevard Stroll to La Mesa! Looking forward to being there on August 3rd.